548 pages | 177 B/W Illus. More than half the world's population now lives in cities. Creating sustainable, healthy and aesthetic urban environments is therefore a major policy goal and research agenda. 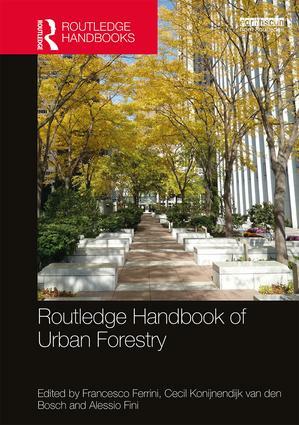 This comprehensive handbook provides a global overview of the state of the art and science of urban forestry. It describes the multiple roles and benefits of urban green areas in general and the specific role of trees, including for issues such as air quality, human well-being and stormwater management. It reviews the various stresses experienced by trees in cities and tolerance mechanisms, as well as cultural techniques for either pre-conditioning or alleviating stress after planting. It sets out sound planning, design, species selection, establishment and management of urban trees. It shows that close interactions with the local urban communities who benefit from trees are key to success. By drawing upon international state-of-art knowledge on arboriculture and urban forestry, the book provides a definitive overview of the field and is an essential reference text for students, researchers and practitioners. Francesco Ferrini is Dean of the School of Agriculture and Professor of Arboriculture at the University of Florence, Italy. Cecil C. Konijnendijk van den Bosch is Professor of Urban Forestry at the University of British Columbia, Canada. Alessio Fini is a researcher in the Department of Production and Agri-Environment at the University of Florence, Italy.